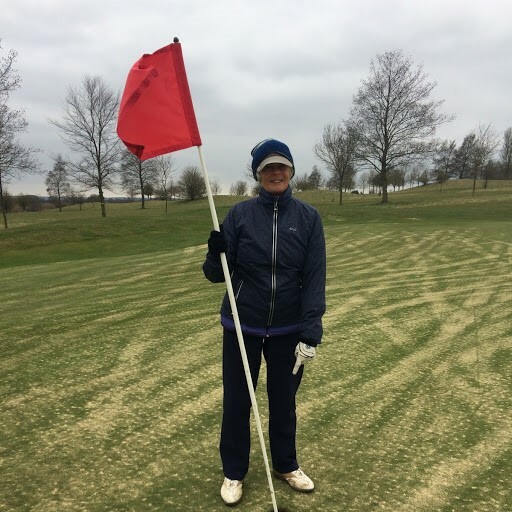 Huge congratulations to Jill Bransby who shot a hole in one at the 12th during our Stableford competition....and on those greens too! Thanks Jill for donating to my Charity in lieu of drinks in the bar. Enjoy a well earned break in Portugal. Jill was the worthy winner of Div 1 with Denise Clinch taking the prize in Div 2 with a massive 38 points, and a handicap cut of 2 shots! Great result Ladies in difficult conditions. The draws were made for both the Singles and Doubles Summer Kos and these will be in black and white on the board this week with the rules of each competition and details of the prelim matches in the singles. The Jubilee Jug sign up sheet will be on the board this week. This popular event is on Thursday April 19th. Please sign up as a pair this year – hopefully this will encourage you to get some fantastic outfits organised in advance! 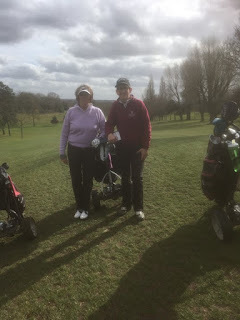 Rogie and I went to play in the Ladies Captains and Vice Captains day at Welwyn Garden City last Friday. We enjoyed the golf and had a good lunch afterwards with useful exchange of views with other Hertfordshire club Captains and Vices. We didn't disgrace ourselves but equally didn't win – the winners have to host next year! Good luck to the Pearson team in their home match v Sandy Lodge on Wednesday. Get out and enjoy your golf!